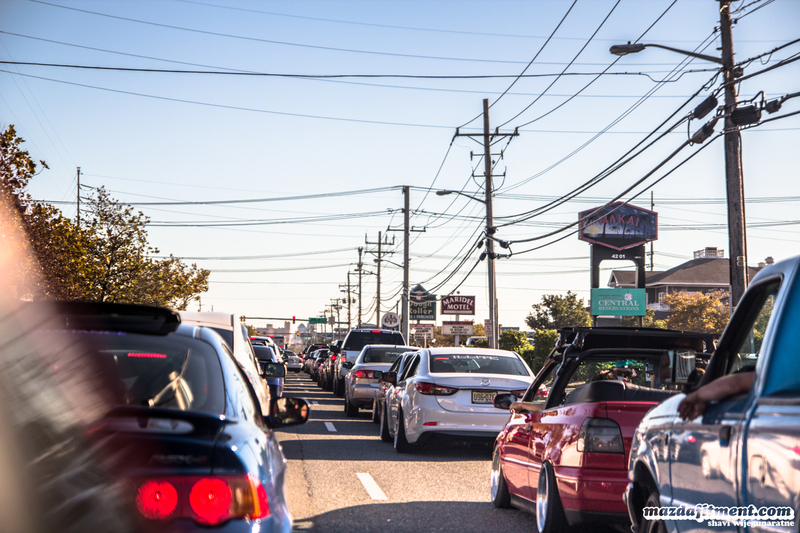 H20 International started as a huge gathering of Volkswagen & Audi owners that wanted to show and enjoy other European cars at a quiet little campground in Ocean City, Maryland. Several years later; it has turned into complete car chaos. 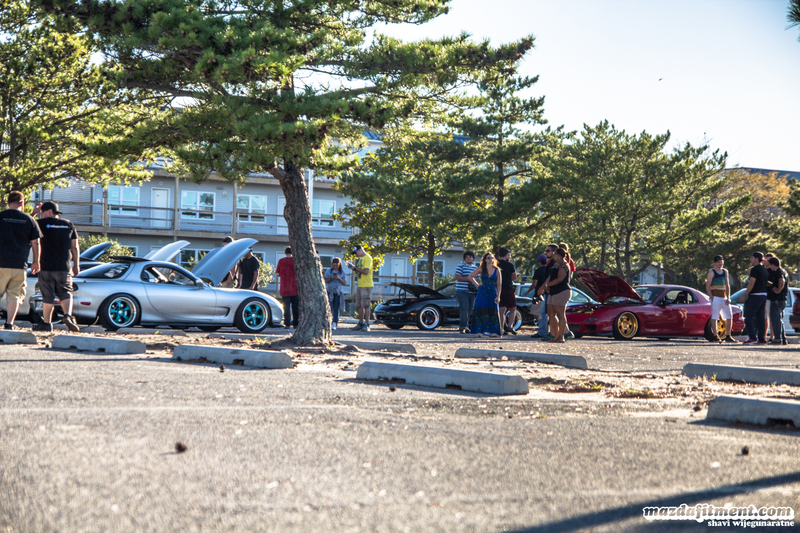 Car enthusiasts travel from all over the world to OCMD for just one weekend at the end of September to escape reality and cruise the strip with the friends that they have made through their automotive creations. 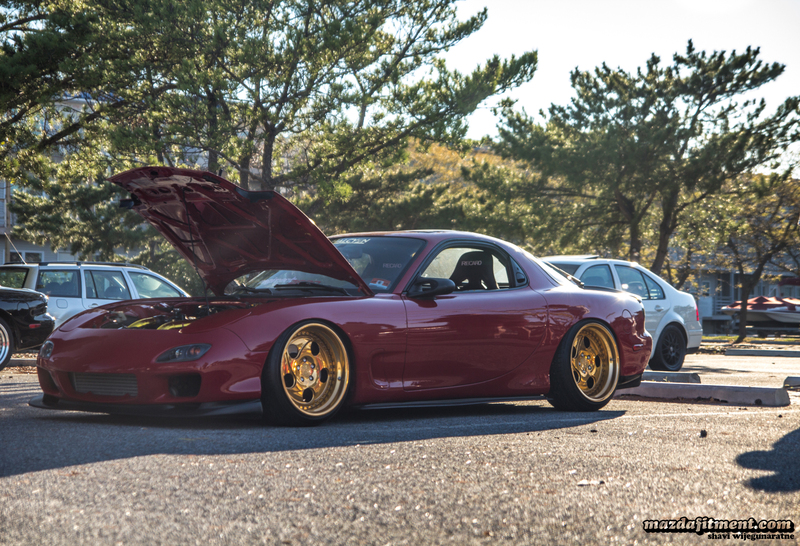 If you have been to H2Oi, you know what I am talking about, and if you haven’t attended yet, we have tried our best to capture what the weekend is all about. For many people, the craziness began on the Monday before the last weekend of September, but for us; it all started on the Friday morning. We started our voyage at Philadelphia International Airport where Shavi Wijegunaratne flew to all the way from SoCal to see what the weekend was all about. 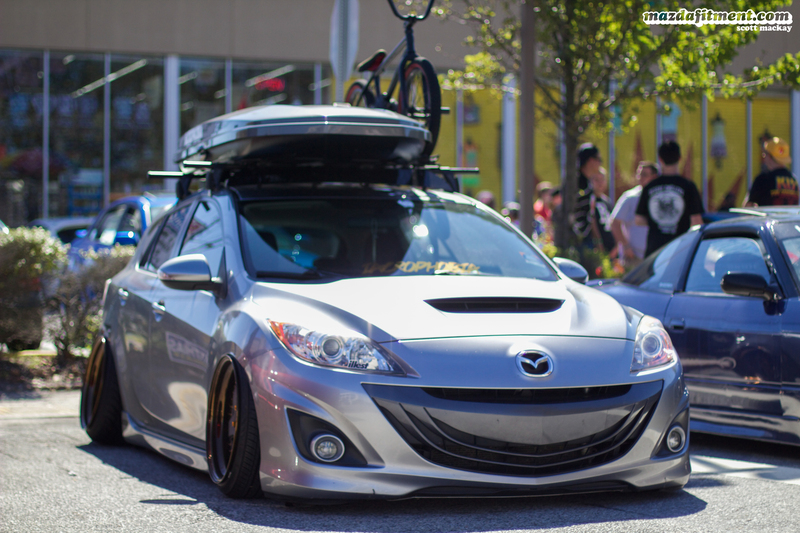 We arrived in the early afternoon and immediately met up with some of the Mazda Fitment family. We drove across the street and parked at the famous Tap House parking lot; luckily we got there early and were able to get some good spots. 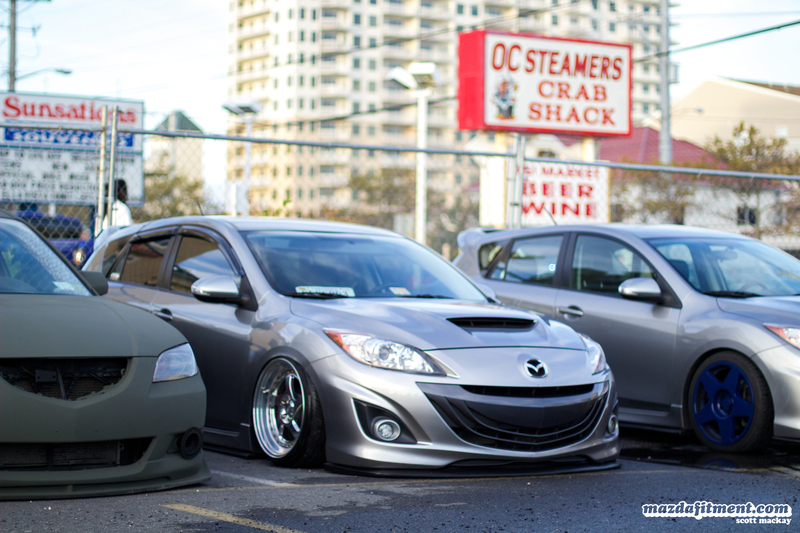 Alex’s bagged Mazda 3 on SSR SP1’S. 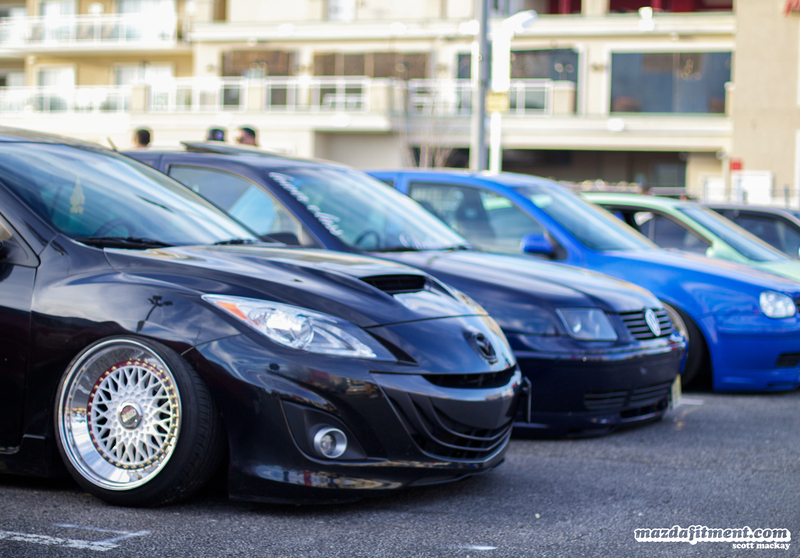 Vinny’s bagged Mazdaspeed3 on slant/step lipped BBS RS’s. 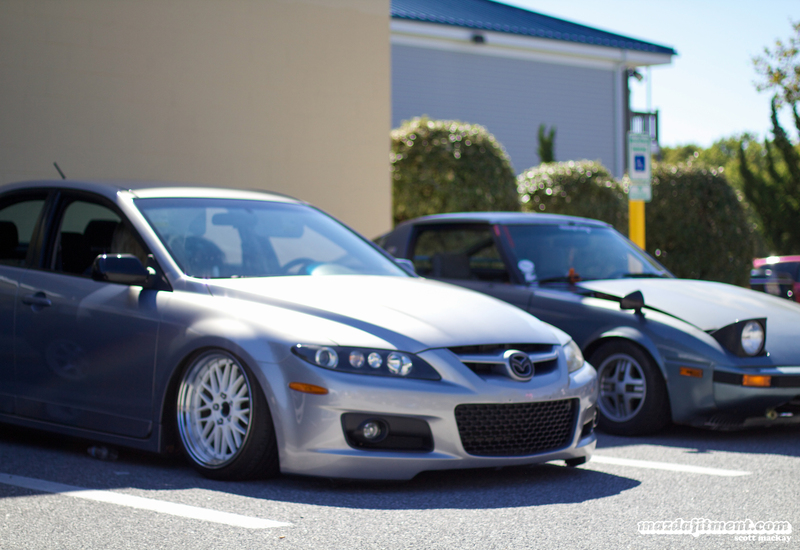 Kevin’s static Mazda 3 Coupe. 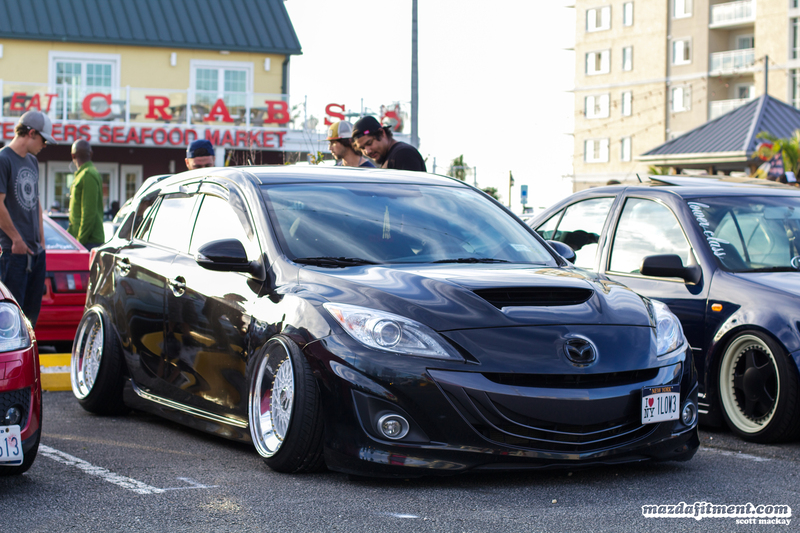 Jovany’s bagged Mazdaspeed3 on CCW LM5T. 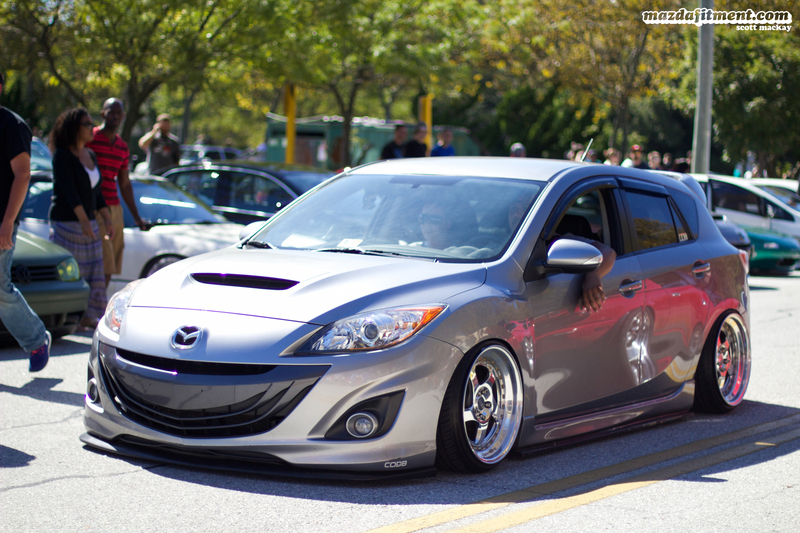 Charlie’s static Mazda 3 on Work Ryvers. A few more Mazdas searched the parking lot for a spot. 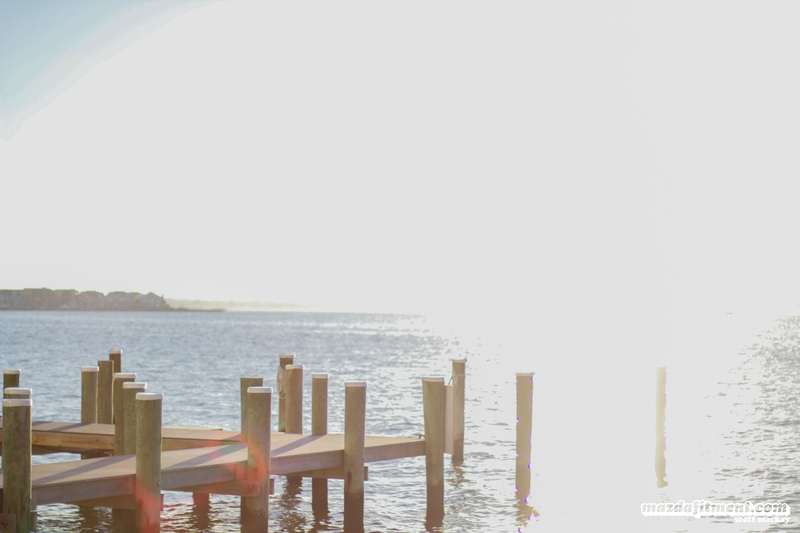 Day turned to night and Coastal Highway turned into something even more wild than before. 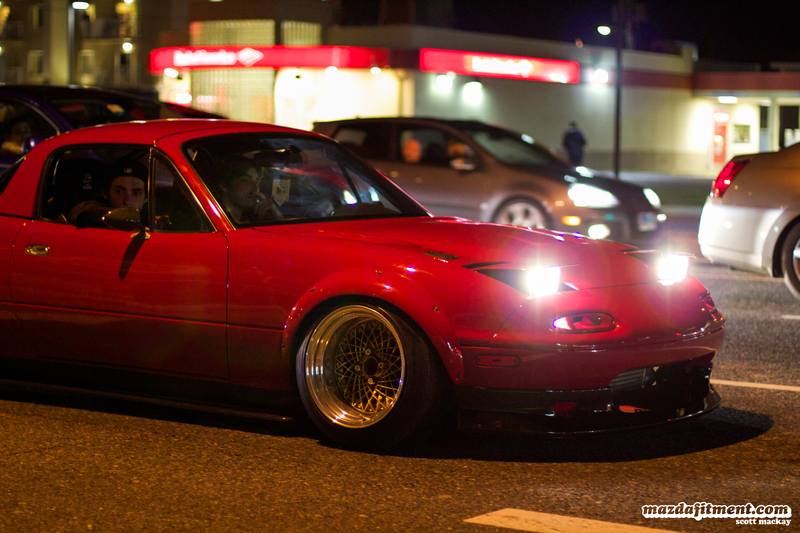 After cruising the strip with everyone; we sat and watched all the unique builds drive by. 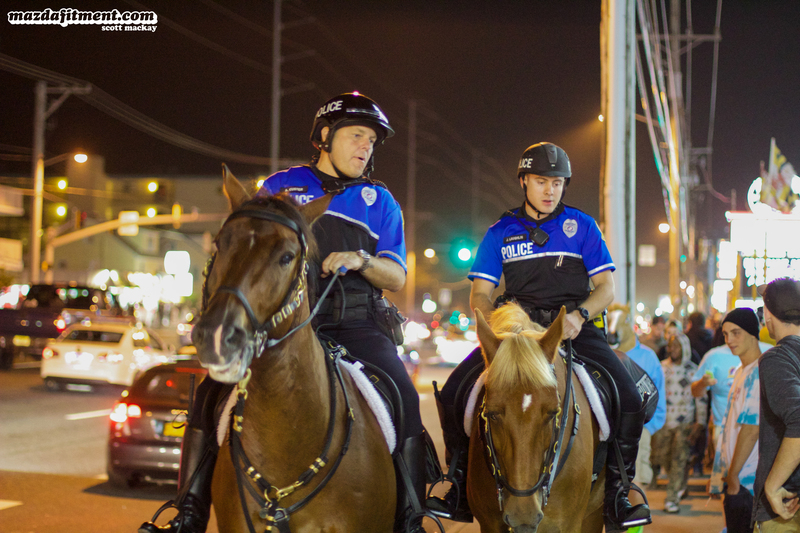 Ocean City Police Department definitely had a very busy weekend. 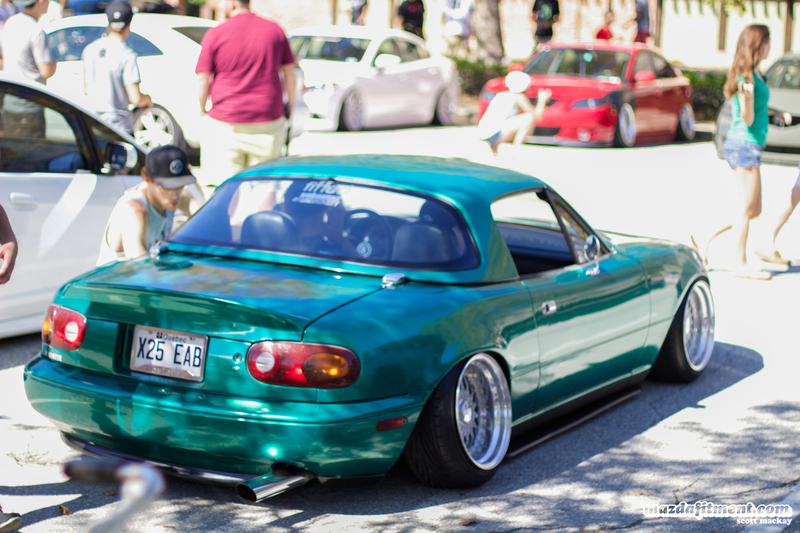 Roman’s roadster on Epsilons. All the way from Quebec, Canada. Ocean City police making sure people are lined up not so far close to the sidewalk. 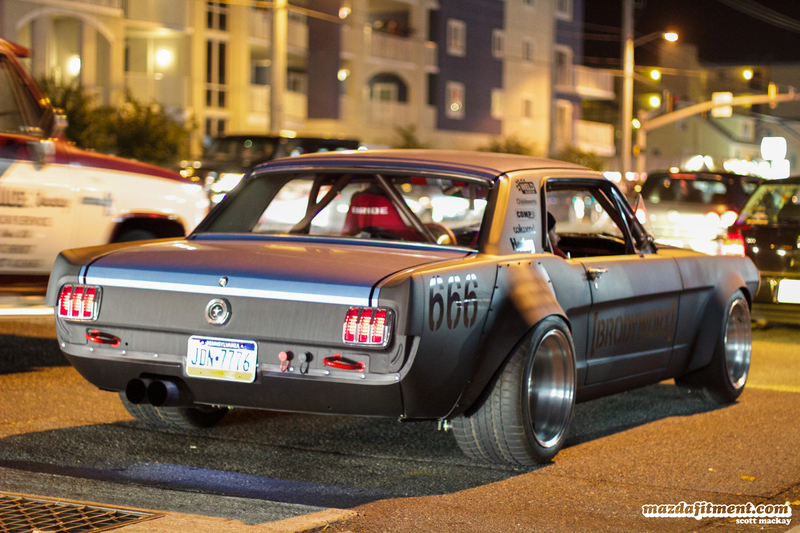 The Brodyworx mustang was truly incredible. 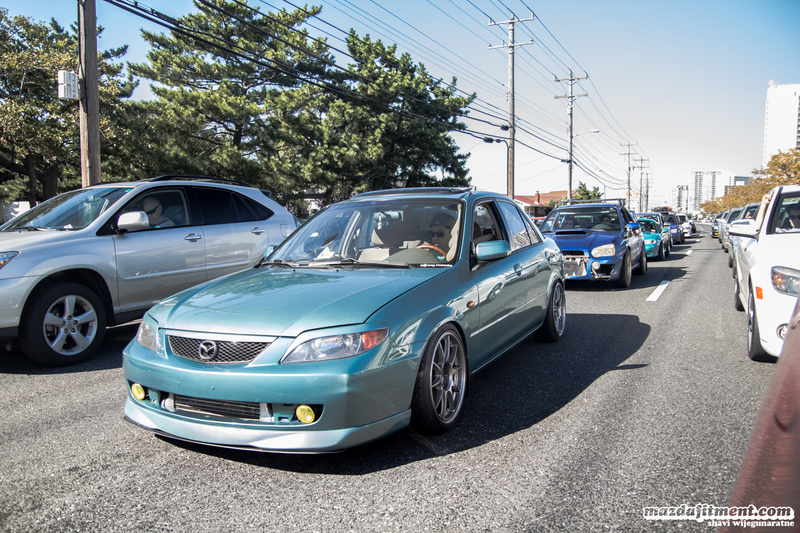 Some of us decided to cruise the strip at night as well, and out of most of the cars out there at that time, the Ocean City police decided to pull over Charlie’s Mazda 3 sedan. 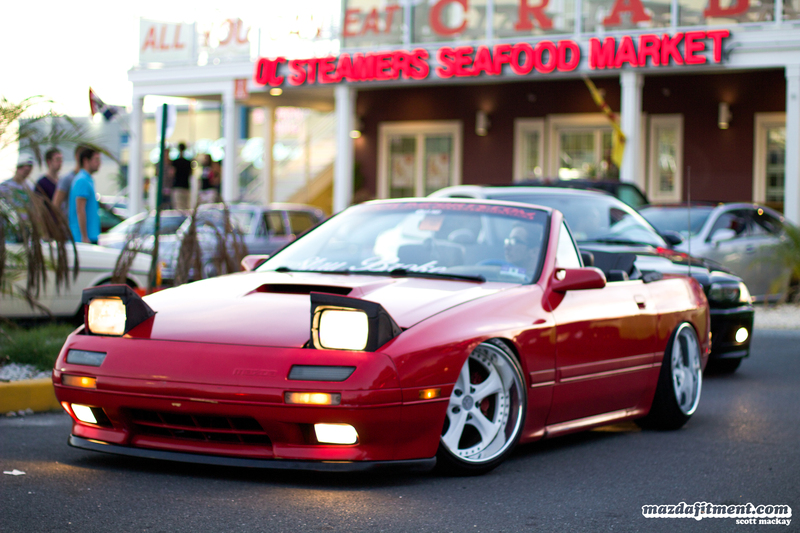 Ocean City police measuring the car for camber, and requesting back up for opinions. 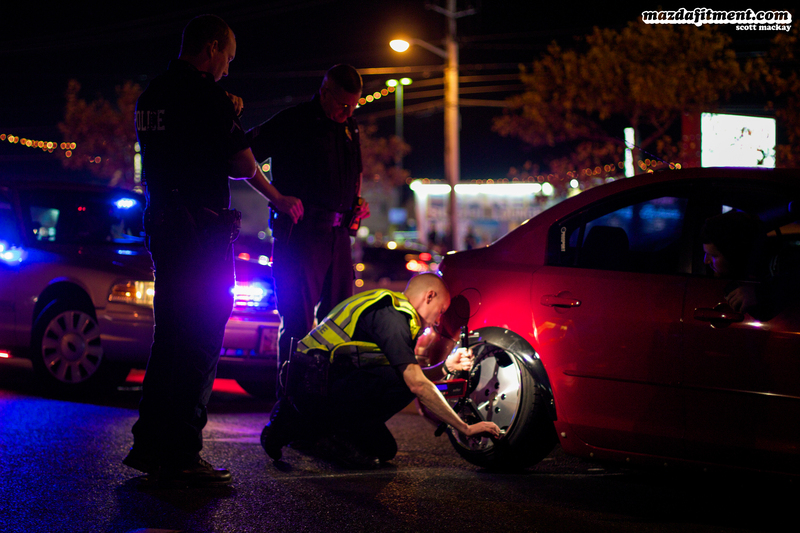 Of course they ended up impounding the car, but it came right back out the same night and back on the roads. The next day it was the big day. 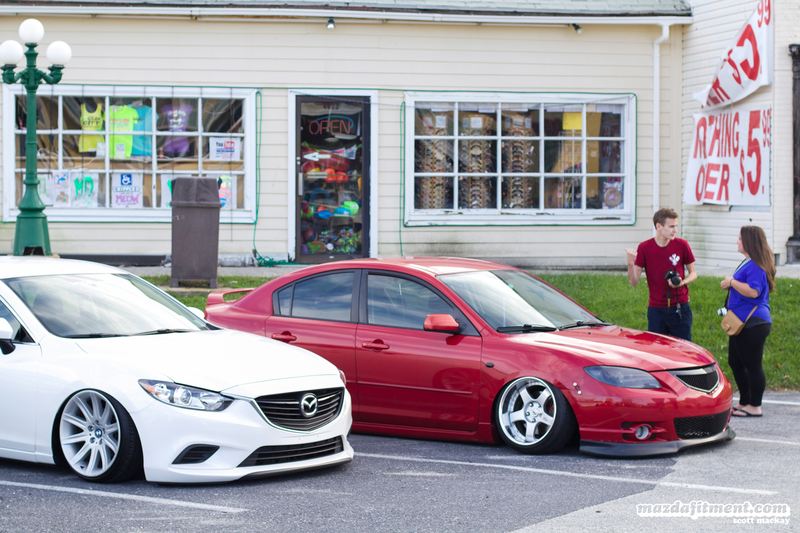 It was the Mazda Fitment x Wrong Fitment Crew meet up. 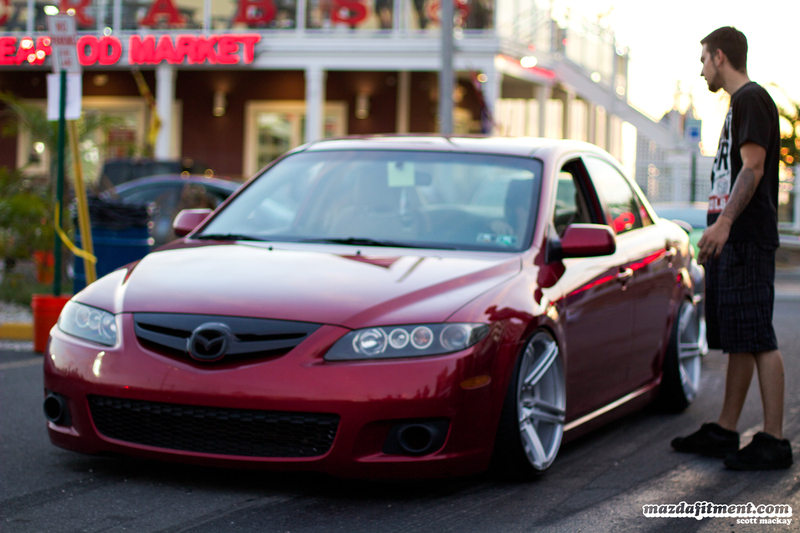 Scott’s bagged Mazda 6 on Style 95s. 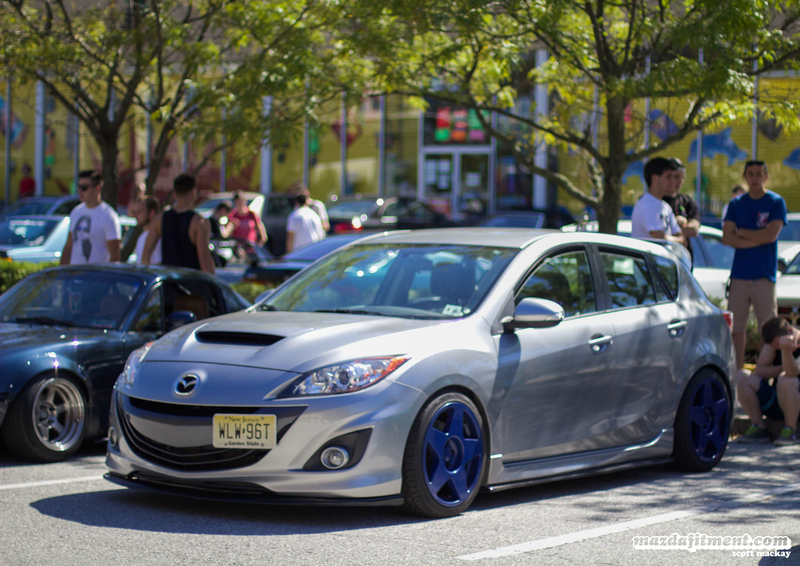 Nick’s Mazdaspeed3 on Fifteen52 Tarmacs. 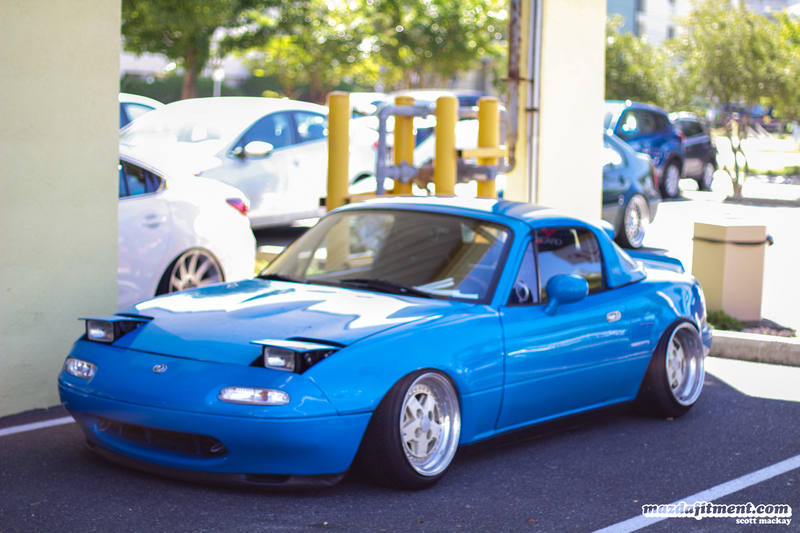 Ryan’s NB Miata on Enkei RPF1s. 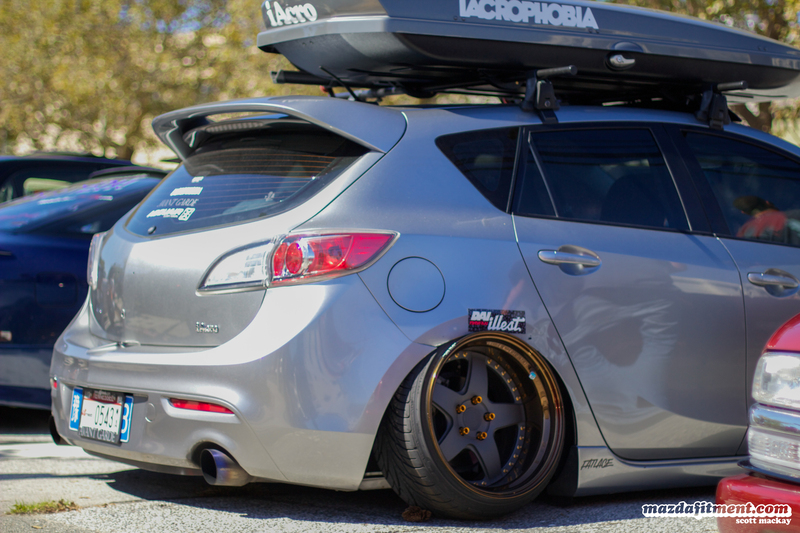 Dongguang’s bagged Mazdaspeed 3 on Avant Garde F130. Sam’s roadster on BBS RS from Quebec, Canada. 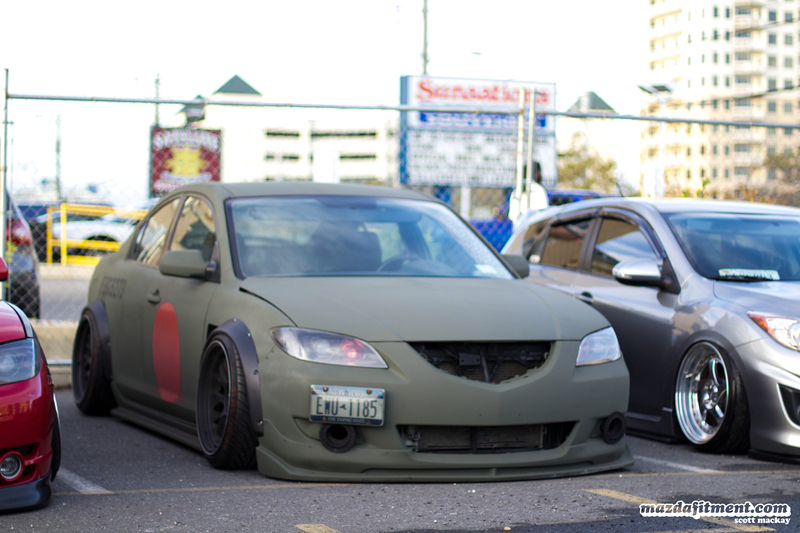 A lot of other cars we didn’t get a chance to take a picture of because we were too busy talking or staring at them. Sometimes traffic on the strip would be pretty bad for a bit, but no need to complain when you are next to cool cars. 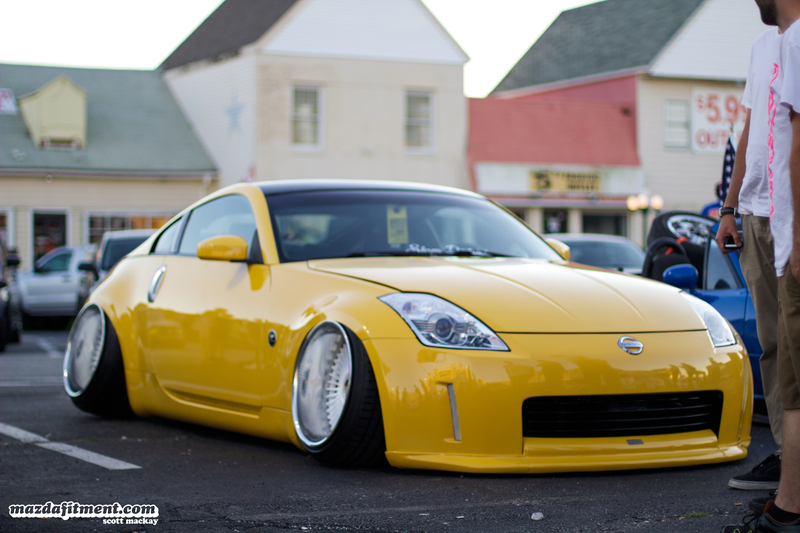 This yellow 350z on Work Emitz got a lot of people looking. 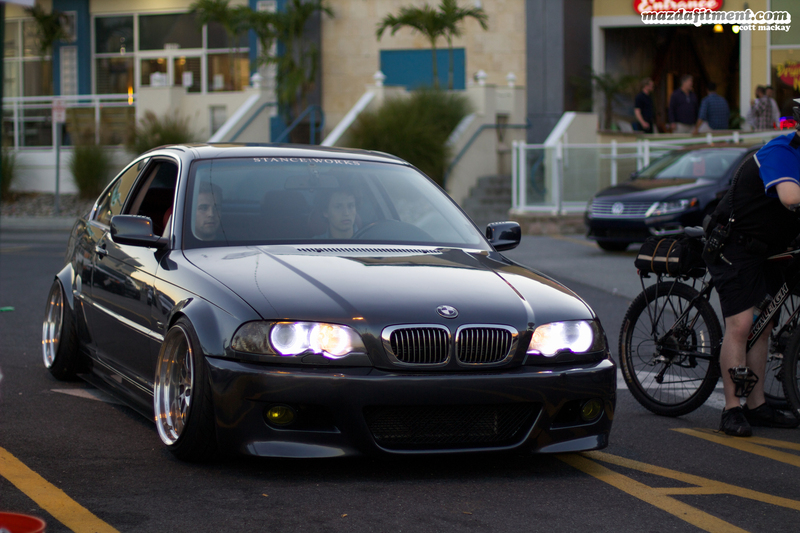 There are way too many cool bimmers out. Thank you to all the new and old friends we made this weekend. 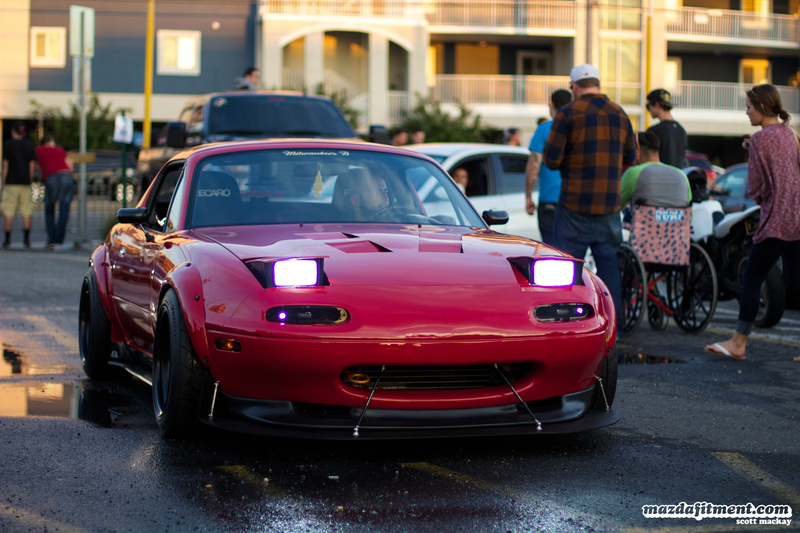 And thank you to everyone that came out to the meet up. Hopefully we can see everyone again next year. 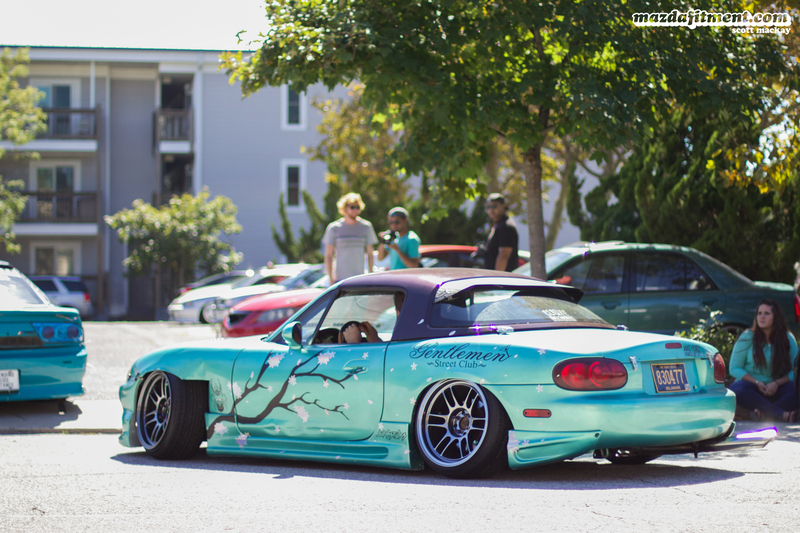 Enjoy more pictures in the gallery below. 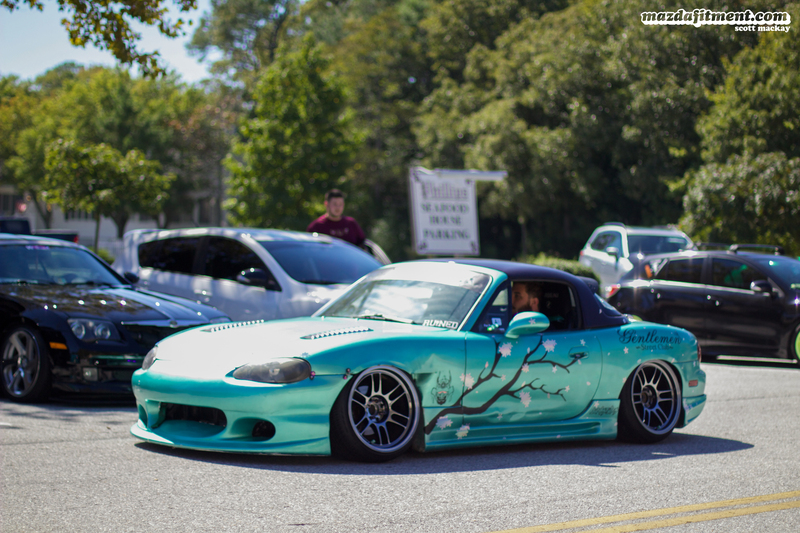 If you have any pictures from H2Oi, please feel free to share it with us. Thanks. 20. Law & Justice Student. 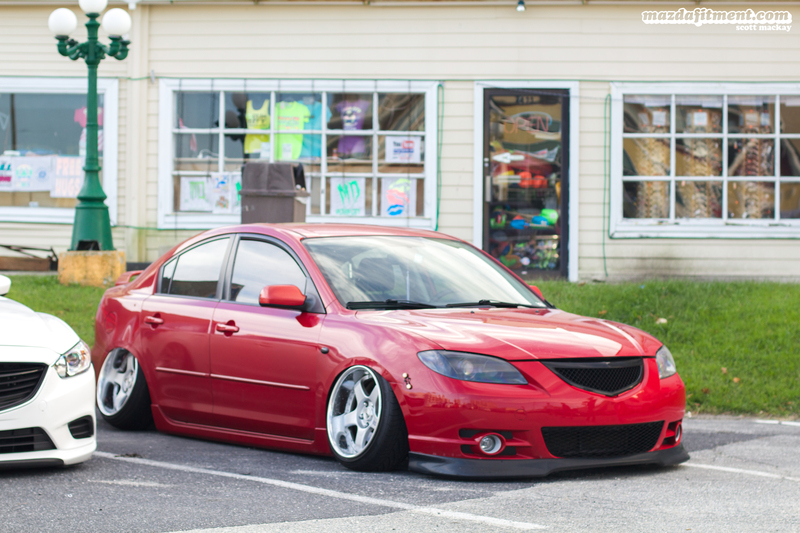 Lowered Cars. Photography. 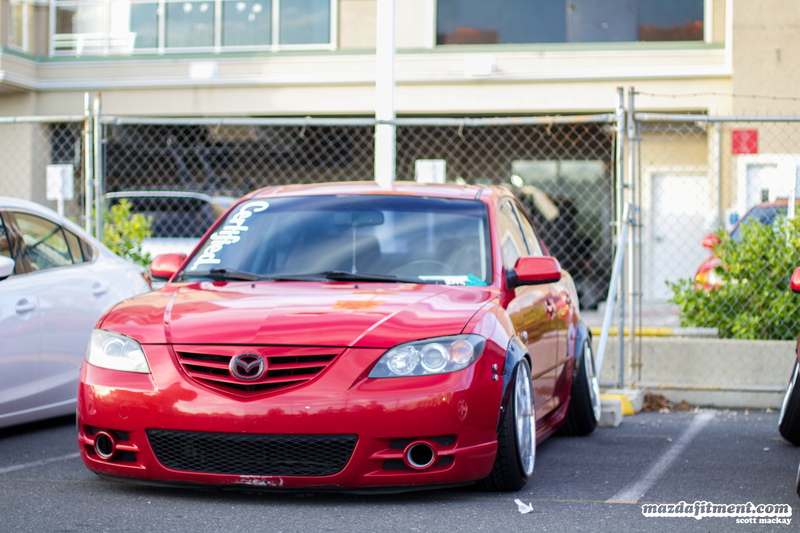 Who is the owner of the HELLA SLAMMED red mazda 6? 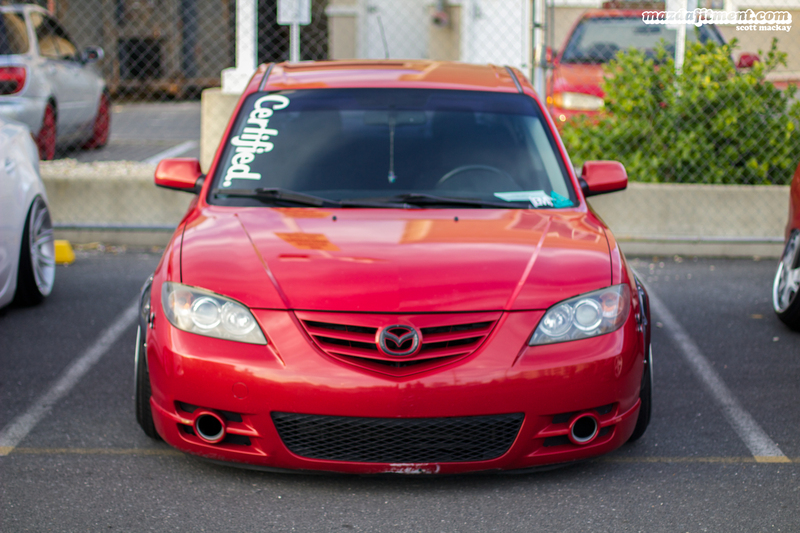 I have some fitment questions for them!